Why you should go: House Manila has got you covered with their Top 40 hits night featuring DJs Lady Trinity, Cherry Summer, Mark Thompson, with MC Orion. Come in a group of eight and you get a free bottle! Other details: Party starts at 10 p.m. For table reservations and to be on the guest list, contact 0915-965-7715 or 0916-638-7666. 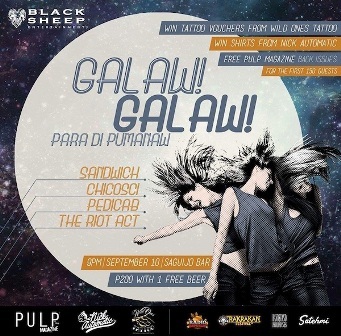 Why you should go: Jump, dance, and sing along to these fun and lively bands—Sandwich, Pedicab, Chicosci, and The Riot Act. Free Pulp Magazine back issues will be given to the first 150 guests and attendees can also win tattoo vouchers from Wild Ones Tattoo and shirts from Nick Automatic. Other details: Gates open at 9 p.m. P200 entrance fee, inclusive of one beer. 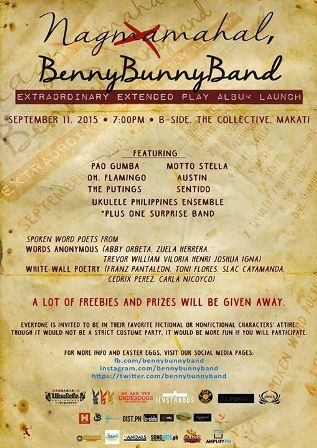 Why you should go: The BennyBunnyBand will launch their album this weekend and helping them out are Pau Gumba, Motto Stella, Sentido, Austin, The Puings, Ukelele Philippines Ensemble, and more. There will also be a spoken word poetry session with members from Words Anonymous and White Wall Poetry. Loads of prizes and freebies to be given away! 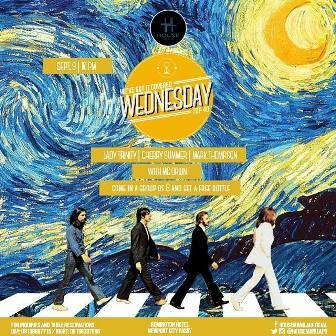 Other details: Gig starts at 7 p.m. Get in for P250! Everyone is also invited to come in costume. 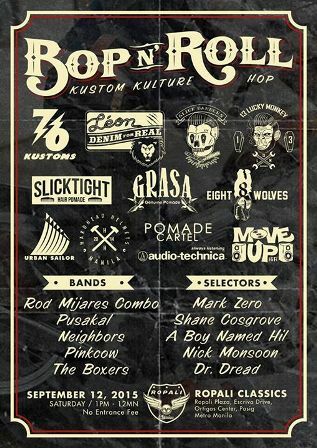 Why you should go: Celebrate your love of music and motorcycle with “kustom culture hop” and bands Rod Mijares Combo, Pusakal, Neighbors, Pinkcow, The Boxers. Invited selectors also include Mark Zero, Shane Cosgrove, A Boy Named Hil, Nick Monsoon, and Dr. Dread. Other details: Event starts at 1 p.m. Entrance is free. 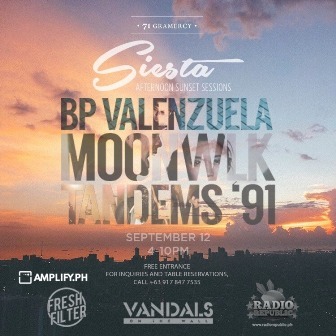 Why you should go: Enjoy a magnificent afternoon sunset view and catch full sets from BP Valenzuela, Moonwlk, and Tandems '91. Other details: Music starts at 5 p.m. Entrance is free. Why you should go: It’s an Eraserheads Tribute Night featuring performances from the PLM Indie Music Community, Eyebee from LPU Cirkulo Musikero, Jeremy Lopez, and Endless Noise. White Wall Poetry will also be reading out Eraserheads-inspired pieces! Other details: Event starts at 7 p.m. Get in for P100, inclusive of one drink. 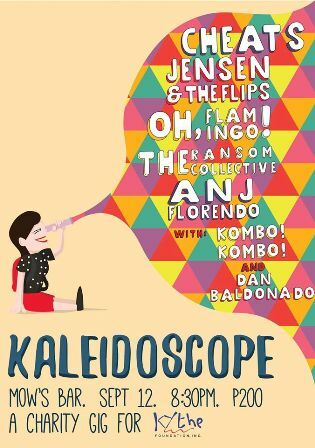 Why you should go: Be blown away with epic sets by Oh, Flamingo, Jensen and The Flips, The Ransom Collective, Cheats, Kombo Kombo, and more. The proceeds from this gig will be given to Kythe Foundation Inc. The funds raised will be used for the medical expenses of a four-year-old cancer patient named Ann Jilian Gonzales. 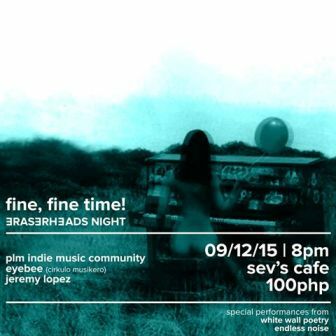 Other details: Gig starts at 8:30 p.m. Get in for P200, inclusive of one beer. 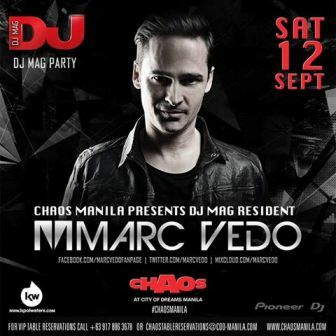 Why you should go: DJ Mag Resident and Top 100 DJ nominee Marc Vedo will be dropping by this weekend! Catch him live on the decks as he spins the hottest tunes. Other details: Party starts at 11 p.m. Tickets are available at SM Ticket outlets. Call 470-222 or visit www.smtickets.com. For VIP table bookings, contact 0917-886-3678. 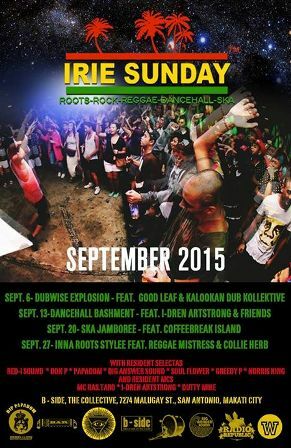 Why you should go: Irie Sunday’s lineup this September has been revealed and this weekend’s offering is all about Dancehall Bashment with I-Dren Artstrong and friends. Other details: Session starts at 9 p.m. RSVP to get in for free at takeovermanila@gmail.com. Why you should go: Drown all your feels with music. Let Urbandub, Clara Benin, Faintlight, Autotelic, and Sirens serenade you. Other details: Gig starts at 9 p.m. For reservation or inquiries, contact 433-8070. Ai-Ai questioned by NY waitress, says "Feeling nila wala akong pambayad"
Has KC Concepcion made up with her exes?